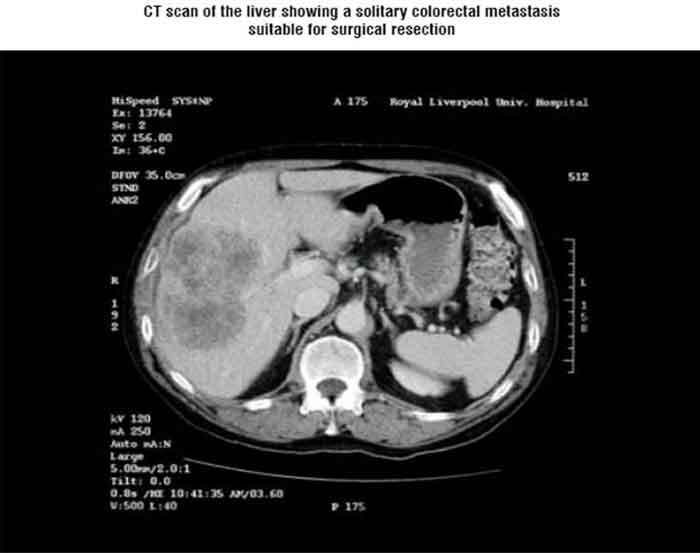 The management of Colorectal Cancer liver metastases has evolved over the past decade as a result of using more sophisticated imaging technology, effective systemic therapies including multi-drug treatment regimes with advanced surgical techniques. This has greatly improved response rates, resectability rates and in turn survival. Life expectancy has increased dramatically over the last hundred years. In the western society it is 75-77 years for men and 80-81 years for women. The demographics of these changes have important consequences for healthcare professionals in oncology. Colorectal Cancer (CRC) is one of the top three causes of cancer deaths, accounting for over one million new cases annually and over 500,000 deaths worldwide. The liver is frequently the only site of metastases in the patients diagnosed with advanced disease; only 20 per cent of patients with liver metastases are possibly amenable to surgical resection with curative intent. Synchronous liver metastases are present in about 20 per cent of patients with CRC, and metachronous liver metastases will subsequently appear in approximately 20–50 per cent of patients. Generally, the median survival time of untreated advanced CRC is between 6-8 months. Those with solitary liver metastases have a better prognosis than those with more extensive disease. Very few patients with liver disease survive for five years without treatment. The management of Colorectal Liver Metastases (CRLM) has evolved over the past decade as reflected by the integration of effective systemic therapies with advanced surgical techniques. Five-year survival rates after resection have increased from 20 per cent to almost 60 per cent in recent series. Although the dramatic improvements may be due to the adoption of more sophisticated imaging technology, the introduction of multi-drug regimens including irinotecan, oxaliplatin, cetuximab, and bevacizumab as components of standard treatment has helped in improving response rates, resectability rates and survival considerably. Up to 20 per cent of patients with ‘liver only’ disease are candidates for potentially curable surgery. The criteria for undertaking surgery include: control of the primary tumour, no extra hepatic disease and resection technically feasible with tumour free margins. A small number of patients with completely resectable extra hepatic disease may survive for a long term. Chemotherapy alone remains palliative but it can double the survival time for patients with unresectable disease. In addition, it may prolong the time to recurrence after resection of hepatic metastases and may bring patients previously judged inoperable to resectability. The combination of chemotherapy and surgery is currently accepted as a way forward for improving survival in patients with initially unresectable CRLM. Standard combination chemotherapy regimens comprising 5-fluorouracil (5-FU) plus leucovorin (LV, also known as folinic acid [FA]) in combination with either irinotecan, typically FOLFIRI or oxaliplatin (FOLFOX) have been reported to facilitate the resection of 9-40 per cent of initially unresectable metastases, with data emerging from randomised trials suggesting that the addition of targeted biologic agents or a third cytotoxic agent might be even more effective. 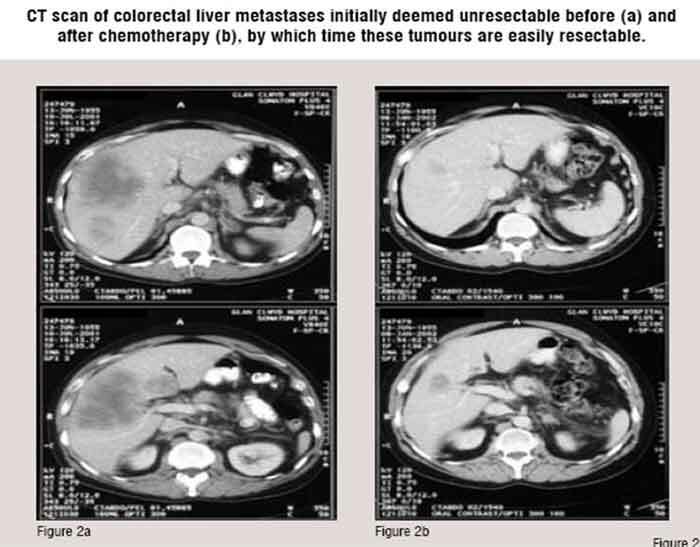 Typically, the liver surgeon is faced with three clinical scenarios when assessing patients with colorectal liver metastases: i) Patients with clearly resectable metastatic disease, ii) Metastatic disease that is initially considered to be unresectable, principally due to location and iii) Patients that are unlikely to ever become resectable. Current treatment practice recommends surgery for resectable liver disease and palliative chemotherapy for those patients with initially unresectable and the patients who are unlikely to ever become resectable disease. However, such chemotherapy may be an integral part of treatment with ultimately ‘curative intent’ if regression means that surgical resection is subsequently possible. In any assessment of chemotherapy regimens, it is necessary for accurate patient classification / staging to facilitate, for example, a degree of cross-trial comparison in a clinical setting where few randomised trials are likely to be conducted and where resectability is such a subjective clinical endpoint. It has been proposed that a new staging system would facilitate a move away from the old ‘catch-all classification’ of stage IV disease to allow stratification of patients from the outset in terms of potential resectability with a view to direct their therapeutic management. The advantages of such a new staging system would be to alert physicians early to the possibility of ‘curative intent’ strategies and to provide a clear indication of therapeutic strategy. Whilst, the ultimate aim of a new staging system would be the better stratification of patients for clinical trials. This is particularly important as moving forward there are likely to be more first-line randomised studies, like the CRYSTAL and OPUS studies where secondary surgical resection rates are important secondary end points of the analysis. Indications for hepatic resection have expanded with improvements in perioperative morbidity and mortality. The underlying surgical approach to CRLM is to identify and resect all macroscopic disease in order to obtain cure. However, debate continues over identifying those patients who may benefit from definitive surgery. The previous reports of prognostic scoring systems can be useful for proper patient selection, improving the outcome after surgery. Today, even in patients with resectable metastases, chemotherapy prior to surgery can increase the complete resection rate, facilitates limited hepatectomies, improves postoperative recovery, treats micrometastases, provides a test of chemo-responsiveness and identifies aggressive disease and spares ineffective therapy. This is supported by the results of the EORTC 40983 / EPOC study where the Progression Free Survival (PFS) rate at three years was increased by 8.1 per cent in those patients who received perioperative chemotherapy and increased to 9.2 per cent by perioperative chemotherapy when compared with surgery alone in the actually resected group of patients. One suggestion is that patients should receive a maximum of six months chemotherapy perioperatively. Thus, patients with technically resectable metastases would receive chemotherapy until first response. In the case of those patients whose metastases were initially classified as unresectable, chemotherapy should be administered until an adequate response has been achieved. Combination chemotherapy, typically infused 5-FU / LV, in combination with either irinotecan or oxaliplatin but also triple cytotoxic drug therapy, e.g. FOLFOXIRI and more recently combination chemotherapy regimens with the targeted agents cetuximab and bevacizumab can render initially unresectable metastases resectable in patients with advanced CRC. The presence of extrahepatic disease no longer precludes surgery provided that it is also resectable. Today, resection rates in excess of 20 per cent are rapidly becoming the norm in small single-centre and single-arm studies provided that patient selection is well done. As a consequence, 5-year survivals of 50 per cent are becoming increasingly common. Current treatment practice for patients with initially unresectable metastatic disease is to treat with the most effective regimen, in terms of response rate and Progression Free Survival (PFS) that the patient can tolerate coupled with the recommendation that surgery should be conducted as early as possible to minimise the effects of chemotherapy on the liver. So, the question arises ‘what defines the most active regimen in this clinical setting?’ In an ideal world it would be hoped that ‘neoadjuvant’ chemotherapy in patients with colorectal liver metastases would not only shrink the tumour but also reduces the recurrence / relapse rate by killing any micrometastases that might remain post surgery. Since response rate correlates with resection rate, regimens that could be selected based on present knowledge are FOLFIRI / FOLFOX alone, these regimens plus a biologic or triple cytotoxic drug therapy in patients with good performance status. Both FOLFIRI and FOLFOX have been shown to be highly effective in facilitating hepatic resections in single-arm studies in selected patients. However, the trend may well be towards the use of three active agents in the form of either combination cytotoxic therapy plus a biologic or three cytotoxics. Certainly, data are beginning to emerge from randomised trials (CRYSTAL and OPUS) of the added benefit conferred by the targeted agent cetuximab on the response rates and resection rates achieved with standard first-line therapies in patients with advanced CRC. Generally, the median survival time of untreated advanced CRC is between 6-8 months. The efficacy of a regimen may primarily be related to its ability to induce sufficient tumour regression to permit R0 resection, but probably what matters most is that the occult tumour cells that the surgeon cannot remove are killed, resulting in a long, relapse-free survival (RFS) post resection. The main concern in the neoadjuvant setting for the treatment of CRLM is that we have no evidence for the impact different regimens have on recurrence rates post resection. Although the intent can properly be termed ‘curative’, cure is rarely achieved. Thus, new trials need to be conducted that link R0 resection to survival and with new trial endpoints that can provide a better measure of the efficacy of the different treatment regimens. Today, patients with metastatic CRC should be treated by multidisciplinary teams comprising surgeons, medical oncologists and radiologists. Evidence of the benefit of perioperative chemotherapy over surgery alone, and the demonstrable benefit of adjuvant chemotherapy (post-liver resection) in one trial caused a rethinking amongst the experts particularly in terms of the timing of the administration of chemotherapy for CRC patients with initially resectable liver and lung metastases. Although the prognosis of metastatic CRC is poor with few patients surviving for five years or more, long term survival has been reported following surgical resection of isolated hepatic metastases. 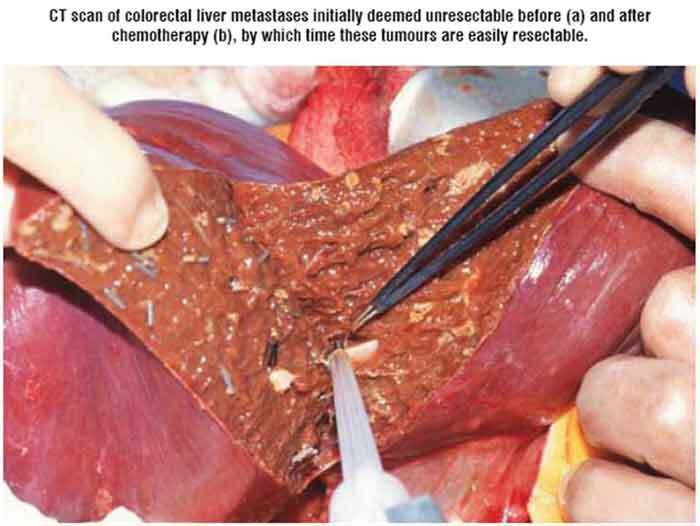 Surgical resection of hepatic metastases is safe. The median postoperative (30 days) mortality is of the order of 2.8 per cent (0-6.6 per cent). The long-term survival of patients undergoing R0 resections is significantly better (32 per cent at five years) than that seen following R1 resections (7.2 per cent at five years) and for those patients who did not come to resection (0 per cent at five years). Patients undergoing surgery may have a better prognosis than other patients with metastatic CRC as they are more likely to be of good performance status and have little or no co-morbidity. A few retrospective studies have attempted to determine the natural history of patients with isolated liver metastases. In a study of 125 patients with liver-only metastases, many who had had no therapy, the median survival was 12.5 months. All patients died within five years and survival correlated with the extent of liver disease. However, the presence of three or less liver metastases was associated with a prolonged median survival of 24 months. Recurrence of cancer is common after resection of CRLM because in the majority of cases the extent of the metastatic disease remains underestimated when using our current pre and intraoperative staging investigations. Of those who recur, one-third suffers from disease recurrence in the liver alone, and occasionally may be candidates for repeat liver resection. The others develop recurrence either synchronously both in the liver and extra hepatic sites, or only at extra hepatic sites. Identification of those prognostic factors that might predict the outcome following surgical resection of CRLM could be helpful. 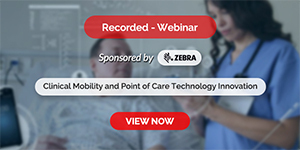 They could help in the identification of the patients most likely to benefit from this intervention, or equally assist in the identification of patients who were unlikely to benefit. However, the use of such scoring systems remains controversial and indeed those which are most published so far depend upon variables (such as surgical resection margins) that can only be determined following liver surgery. Surgical resection of CRLM can be performed safely with low mortality and morbidity rates. It was observed that one-third of the patients who had undergone surgery were alive even after five years, which was not seen in those patients who were unsuitable for surgery. Perioperative chemotherapy will ensure three-year disease-free survival in patients following liver resection. In addition, modern chemotherapy will now convert a significant number (10-20 per cent) of patients deemed unresectable at presentation to surgical resectability. Future studies now need to address the question of whether even more patients can be brought to such surgery with curative intent using either conventional chemotherapy or chemotherapy in combination with the newer biological agents. Graeme Poston is Director of the Division of Surgery, Digestive Diseases, Critical Care and Anaesthesia at University Hospital Aintree (UHA) Liverpool UK. He is also is a Council member of the European Society of Surgical Oncology and the UK and Ireland Neuroendocrine Tumour Society. He has authored eight textbooks of surgery, in addition to over 140 peer reviewed papers, mainly on the subject of HPB diseases. Vivek Upasani is working as a Specialist registrar in the renowned supra-regional hepatobiliary unit at Aintree University Hospital, Liverpool. Add two more lines.